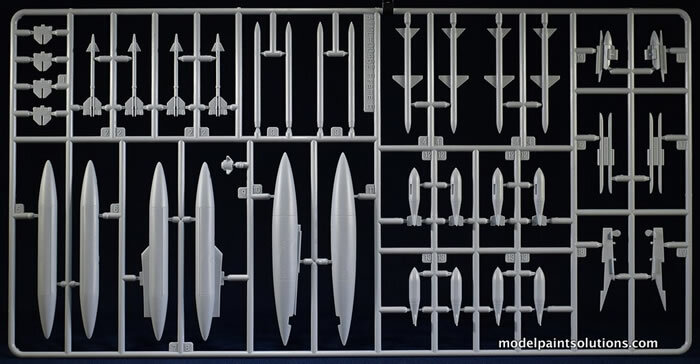 121 parts on 6 grey styrene sprues (not all are used), 13 clear parts, one decal sheet with markings for 3 airframes. 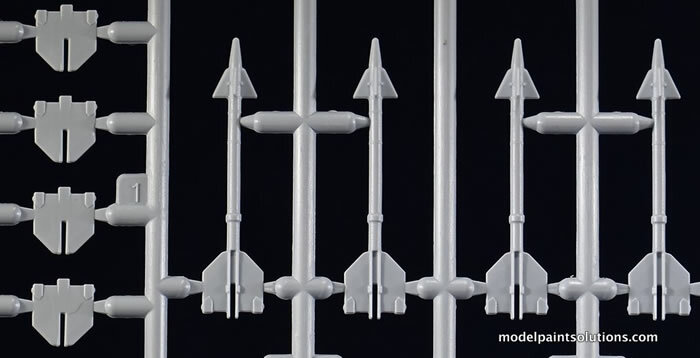 Surface details are restrained and scale-appropriate; building options include “in-flight”, “ready for launch”, and “stowed” with folded outer wing panels and folded radome; canopy can be built open or closed; quality decals for three schemes plus airframe stencils provided..
Fine, recessed panel lines and scale-appropriate surface details combined with crystal-clear canopy parts, and building options that include folded wings and radome: the Airfix Phantom FG.1 delivers. The United Kingdom operated the McDonnell Douglas F-4 Phantom II as one of its principal combat aircraft from the 1960s to the early 1990s. The UK was the first export customer for the Phantom, which was ordered in the context of political and economic difficulties around British designs for the roles that it eventually undertook. The Phantom was procured to serve in both the Fleet Air Arm and Royal Air Force in several roles including air defense, close air support, low-level strike and tactical reconnaissance. Although assembled in the United States, the UK's Phantoms were a special batch built separately and containing a significant amount of British technology as a means of easing the pressure on the domestic aerospace industry in the wake of major project cancellations. Two variants were initially built for the UK. The F-4K variant was designed from the outset as an air defense interceptor to be operated by the Fleet Air Arm from the Royal Navy's aircraft carriers while the F-4M, procured for the RAF, serve in the dual roles of tactical strike and reconnaissance. In the mid-1980s, a third Phantom variant was obtained when a quantity of second-hand F-4J aircraft were purchased to augment the UK's air defenses following the Falklands War. The Phantom entered service with both the Fleet Air Arm and the RAF in 1969. In the Royal Navy it had a secondary strike role in addition to its primary use for fleet air defense. While in the RAF, it was soon replaced in the strike role by other aircraft designed specifically for strike and close air support. By the mid-1970s it had become the UK's principal interceptor, a role in which it continued until the late 1980s. In 1964, 140 new-build Phantoms were ordered for the Fleet Air Arm to serve as the Royal Navy's primary fleet air defense aircraft, with a secondary strike capability. These were procured to replace the Sea Vixen then in service in the role, with the intention that they operate from the decks of four brand new or modernized aircraft carriers. At the time, the Royal Navy's carrier force consisted of five fleet or light fleet carriers of differing sizes and ages. Of the five in service, only Eagle and Ark Royal, each displacing approximately 50,000 tons, were big enough to accommodate the Phantom in sufficient numbers, so plans were put in place to rebuild the two ships to enable the operation of the aircraft. At the same time, two new aircraft carriers were planned. The requirements for the intended force of four carriers meant that five squadrons of Phantoms would be needed. However, in its 1966 Defense White Paper, the Government decided to cancel the two new carriers, which led to reductions in the total order for the Royal Navy's Phantoms. Initially 143 were ordered, which was cut to 110, and finally just 50, with options for another seven. The intention was to form a pair of front-line squadrons, each of twelve aircraft that would operate from the two remaining, heavily modernized fleet carriers. The rest of the aircraft would be a reserve and for training. The Royal Navy received its first F-4K Phantoms, which carried the British designation FG.1, in April 1968. These were assigned to 700P Naval Air Squadron (NAS), which was to serve as the Intensive Flying Trials Unit. Upon completion of the successful flight trials, 767 Naval Air Squadron was commissioned in January 1969 as the FAA's training squadron. This was followed at the end of March 1969 by 892 Naval Air Squadron, which was commissioned as the Royal Navy's first operational Phantom unit, intended to embark in Ark Royal once her three-year refit was completed in 1970. At the same time the Fleet Air Arm was receiving its first aircraft, the Aeroplane and Armament Experimental Establishment had three FG.1s delivered to its 'C' Squadron for flight deck trials aboard Eagle. Two sets of trials were successfully carried out in March and June 1969; the first comprised approaches and touch and go landings, while the second set of trials involved full catapult launch and arrested recovery. As a result of the reheat from the Spey turbofans, the ship's jet blast deflectors (JBD) were not used; instead a steel plate was fixed to the deck to absorb the heat of the engines building to launch, and fire hoses were used after each launch to prevent them melting. Ark Royal had entered refit to accommodate the Phantom in 1967; this involved major reconstruction including several elements to allow the ship to operate the aircraft – the flight deck was increased in area and fully angled to 8½°, the arresting gear was replaced with a new water-spray system to accommodate the Phantom's higher weight and landing speed, and bridle catchers as well as water-cooled JBD’s were fitted to the catapults. Once this work was complete, Eagle was scheduled to undergo a similar modernization. In 1969, the planned refit of Eagle was cancelled, and the options for seven additional FG.1s were not taken up. As a consequence, it was decided to further reduce the FAA's Phantom fleet to just 28 aircraft. The remaining 20 aircraft were then allocated to the Royal Air Force. In 1970, Ark Royal embarked 892 NAS as part of her air group for the first time, with a total of 12 aircraft. The first operational use of the Royal Navy's Phantoms had come in 1969, when 892 NAS embarked for training with the US carrier USS Saratoga in the Mediterranean, and had undertaken air defense missions alongside the ship's own F-4Js. This deployment showed the necessity for the modifications fitted to Ark Royal, as the heat from the afterburners of the Spey, combined with the increased angle of attack resulting from the extendable nosewheel, during the initial launches from Saratoga caused the deck plates to distort, leading to subsequent catapult launches being undertaken at reduced weight without the use of re-heat. During Ark Royal's first three-year commission, 892 NAS, which had initially used RNAS Yeovilton in Somerset as its home base, moved to RAF Leuchars in Fife where, during the periods when it was not embarked, it undertook Quick Reaction Alert (QRA) duties alongside the RAF's 43 Squadron. The Phantom served in the Fleet Air Arm until 1978, when Ark Royal was finally withdrawn from service, leaving no ship in the Royal Navy capable of operating the type. The final catapult launch from Ark Royal was a Phantom of 892 NAS on 27 November 1978 during the disembarkation of the air group following the ship's final deployment; the squadron's aircraft were delivered to RAF St Athan in Wales, where they were handed over to the RAF. During the type's service with the Royal Navy, 10 of the total FAA fleet of 28 were lost in crashes. Following the cancellation of the planned refit of HMS Eagle to allow her to operate the Phantom, a total of 20 airframes that had originally been ordered for the Fleet Air Arm were diverted to the Royal Air Force to serve in the air defense role. At the time, the RAF's primary interceptor was the English Electric Lightning, which suffered badly both in terms of range, loiter time and weapons fit, all of which hampered its effectiveness, especially in long interceptions of Soviet Air Forces and Soviet Naval Aviation bombers and reconnaissance aircraft over the North Sea and North Atlantic. So a new Phantom squadron was formed at RAF Leuchars, the UK's most northerly air defense base at the time, to take advantage of the improvements that the Phantom provided over the Lightning – it could carry more fuel, and could thus fly further for longer; it was fitted with a more powerful radar; and it could carry more missiles (up to 8, compared to 2 for the Lightning). On 1 September 1969, 43 Squadron was formed at Leuchars, operating as part of the UK's northern QRA zone alongside the Lightning’s of 11 Squadron and 23 Squadron until, in 1972, 11 Squadron was redeployed to join 5 Squadron at RAF Binbrook and was replaced by the Royal Navy Phantoms of 892 Naval Air Squadron. Although there were minor differences between the two types of Phantom built for the UK, there were many significant ones between the British Phantoms and those built for the United States. The most obvious was the substitution of the Rolls-Royce Spey turbofan for the General Electric J79 turbojet. The Spey was shorter but wider than the J79, which meant that the British Phantoms' intakes had to be redesigned for a higher airflow, making them 20% larger (with a consequent increase in drag), while the fuselage was widened by 152 mm (6.0 in). 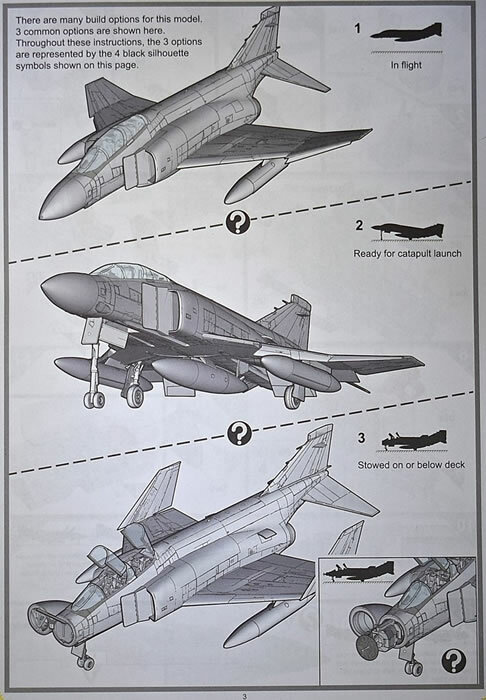 The position of the afterburner also meant that the rear of the fuselage had to be made deeper. Auxiliary intake doors were fitted on the rear fuselage. Performance estimates of the Spey-engined Phantom contrary to its American equivalent indicated that the former had a 30% shorter take-off distance, 20% faster climb to altitude, higher top speed and longer range. The Spey was more efficient at lower altitudes, and had better acceleration at low speed, giving British Phantoms better range and acceleration, which was shown during the deployment of 892 NAS to the Mediterranean aboard USS Saratoga in 1969, when the F-4K was repeatedly quicker off the deck than the F-4J used by the Americans. It was less efficient at higher altitudes, the British Phantoms lacking speed compared to J79-powered versions owing to the increased drag of the re-designed fuselage. This discrepancy became apparent when the F-4J was obtained by the UK in 1984; it was regarded as being the best of the three variants to serve in the RAF. The small size of the aircraft carriers Eagle and Ark Royal, from which the Royal Navy's Phantoms were intended to operate, compared to the US Navy carriers of the period, meant that the F-4K version required significant structural changes compared to the F-4J, from which it descended, and which performed a similar role. As well as the folding nose radome to allow for storage in the smaller hangars of the British ships, it had to have a significantly strengthened undercarriage to account for the higher landing weight (British policy was to bring back unused ordnance). It had a telescopic nosewheel oleo that extended by 40 inches (100 cm) to provide an increased take-off attitude (the extension of the nosewheel put the Phantom at a 9° attitude) due to the shorter and less powerful catapults. It was also fitted with drooping ailerons, enlarged leading edge flaps, a slotted tail plane and increased flap, and leading edge blowing, all to improve lift and handling characteristics for operation from the smaller Royal Navy carriers. The McDonnell-Douglas F-4 Phantom is an aircraft that looms large for many aviation-minded folk—this one in particular. As a young boy growing up on military bases I was impressed (imprinted?) by the sight and sound of the Smoking Thunder Hog. That’s my personal favorite of the many nick names applied to the Phantom, including Double Ugly, Old Smokey, Lead Sled, and Rhino. Luftwaffe Phantom’s earned the appropriate Fliegender Zieglestein (Flying Brick) while Israeli pilots called it the Kurnass (Hammer). Whatever name you prefer, it’s still the cranked-wing Thunder Hog: an aircraft that has been well served by the modeling industry with numerous manufacturers producing multiple variants of the type. 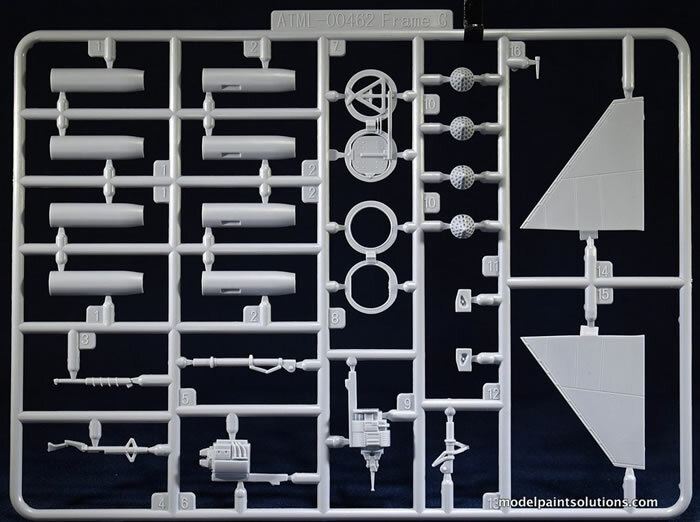 A good portion of the insulation for my model shop is composed of Phantom kits in multiple scales from Fujimi, Hasegawa, Academy, Tamiya, Zokei Mura, and now Airfix. Yea, I have a bit of a Phantom fetish. 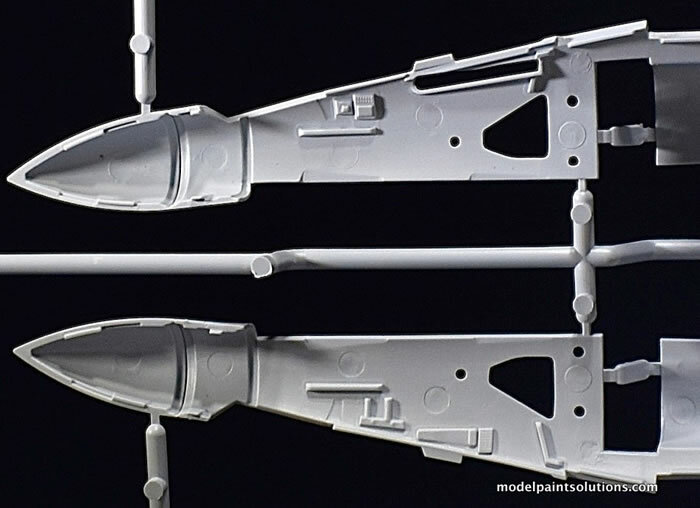 The new Airfix Phantom, released along with their 1/72 B-25 C/D, is a very nice piece of work with the same finesse and restrained approach to inscribed details and panel lines as seen on the Mitchell. I will leave considerations of accuracy and the inevitable comparisons with other Phantom kits to those with the required knowledge on the subject. 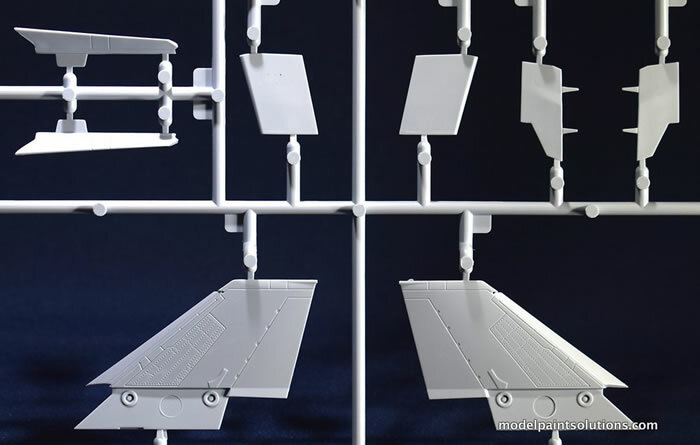 To this reviewer, the Airfix Phantom is a beautiful kit and one that offers a lot of very nice options right out of the box. 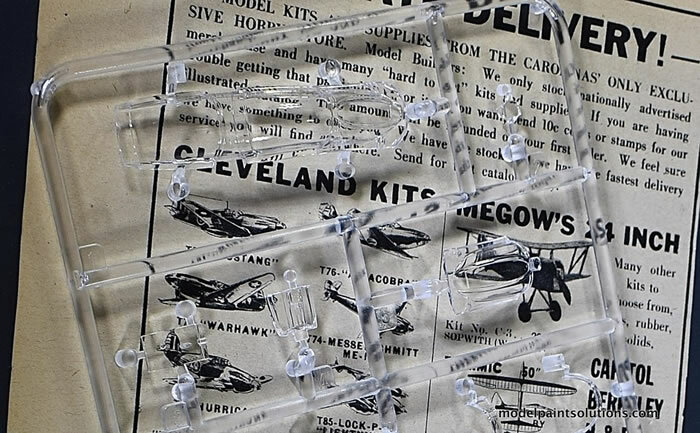 In the characteristic red Airfix lidded-box you’ll find one large bag containing 6 light grey sprues, and one sprue of clear parts in a sealed bag. 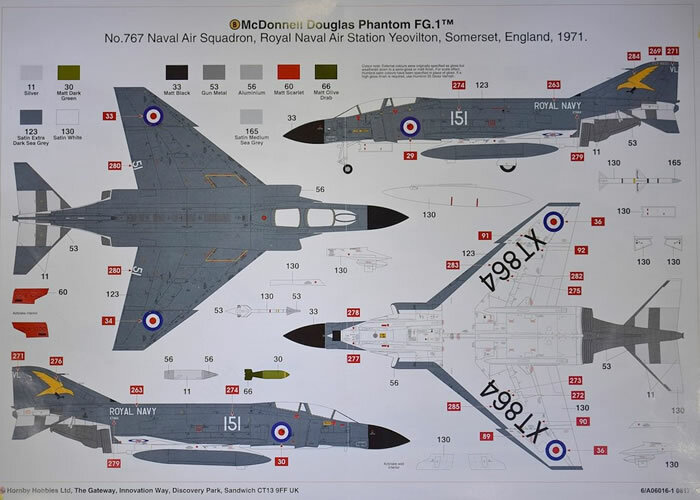 Along with the Airfix-style instruction booklet are two large (11.5 x 16.5 inch) two-sided, foldout sheets that provide 4-view color images of the three schemes covered by the decal sheet plus airframe stencil data. 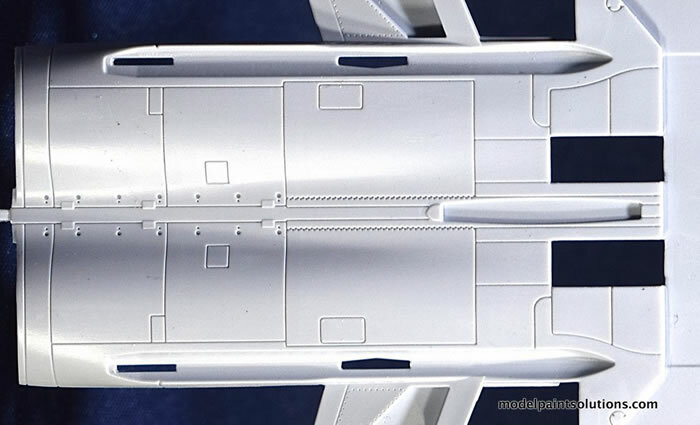 The panel lines and recessed details, in particular, stand out as having been done with a scale-appropriate restraint that represents a substantial improvement over some previous 1/72 Airfix offerings. 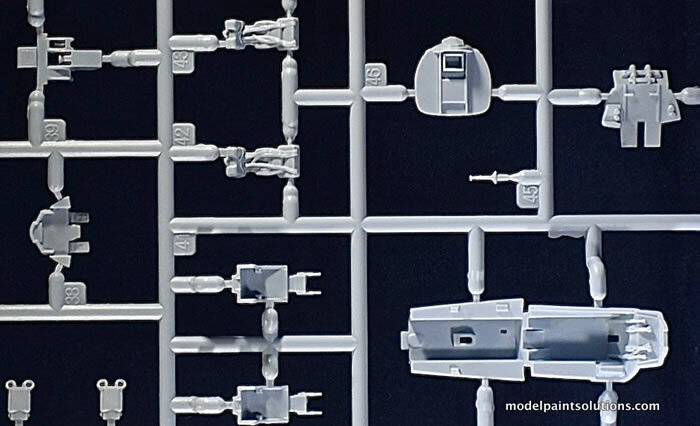 On this point Airfix deserves to be acknowledged for listening to the critics and responding with better and finer surface details that are now comparable with some of the best in the industry: Well done, Airfix. 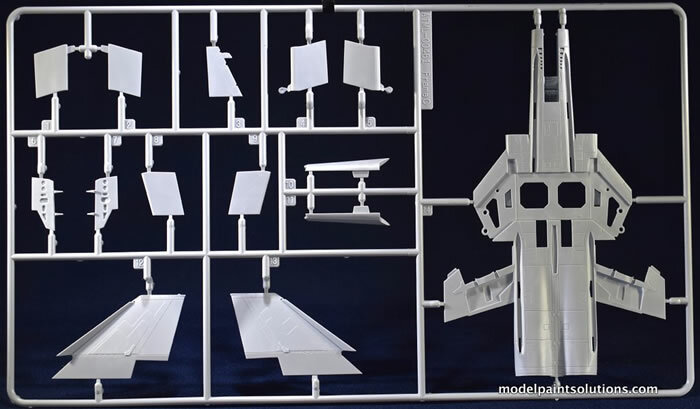 First up in the instructions the modeler is presented with the three building options provided in the kit: “In-flight”, “Ready for catapult launch,” and “Stowed on or below deck.” That last option entails folded outer wing panels and radome (more below). With the big decision made, construction begins, as usual, with the cockpit. The nicely molded seats are composed of 3 parts and have the harnesses molded in relief. Instrument panels and side consoles are provided as well printed multi-part decals. With the cockpit complete, the two-piece intake trunks are assembled next and installed in each fuselage halve. 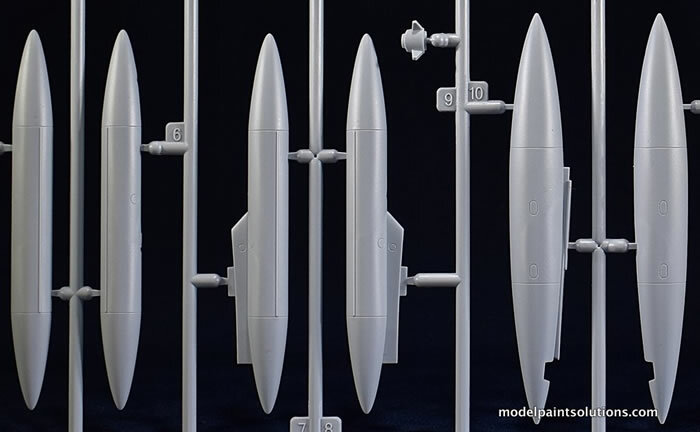 If the model is to be built in the “stowed” configuration (radome folded), the builder will have to perform a little styrene surgery and remove the nose cone section from each halve. In addition, small inserts that hold the horizontal stabilizers at angles appropriate for either an in-flight or on-the-ground configuration have to be placed in each halve prior to assembling the fuselage. Construction then continues with the surprisingly simple engine/after- burner assemblies and belly center section where holes will have to be drilled to accommodate whatever load (wing tanks, munitions) you intend to hang on your Phantom. 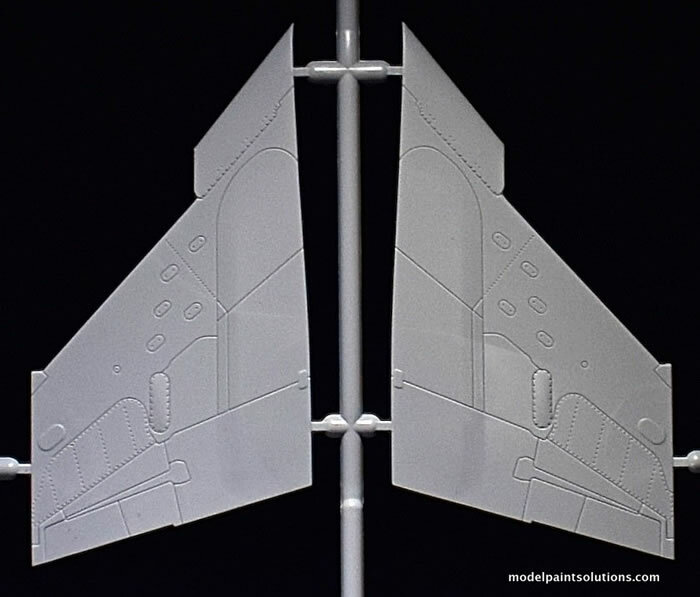 Next in sequence is the attachment of the nicely molded empennage (vertical and single-piece horizontal stabilizers). 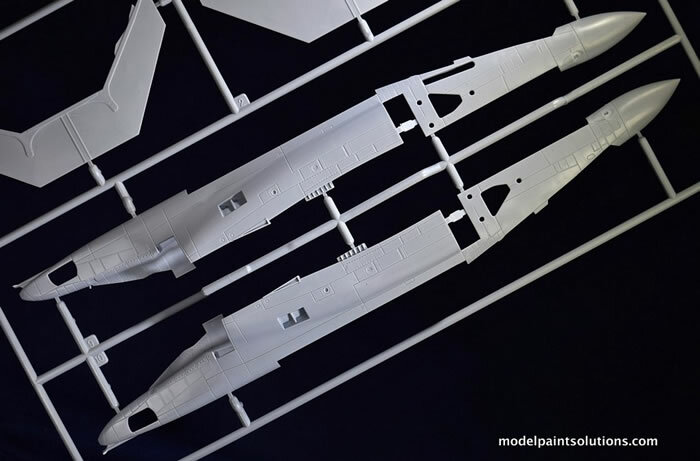 Here the modeler may want to deviate from the building sequence and leave the horizontal stabilizers off to facilitate masking and painting. With the fuselage complete, the wing is assembled next starting with the outer panels first. 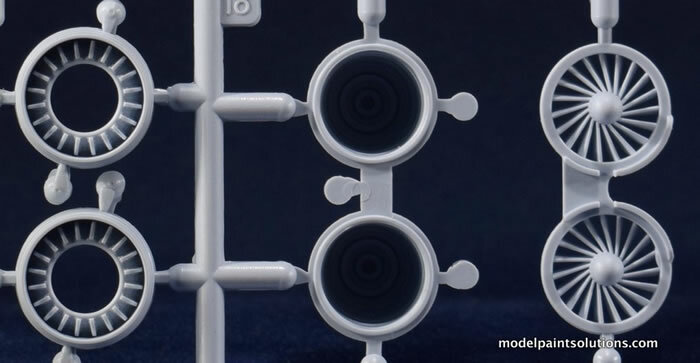 Here the modeler is given the option of using extended or folded outer panels. 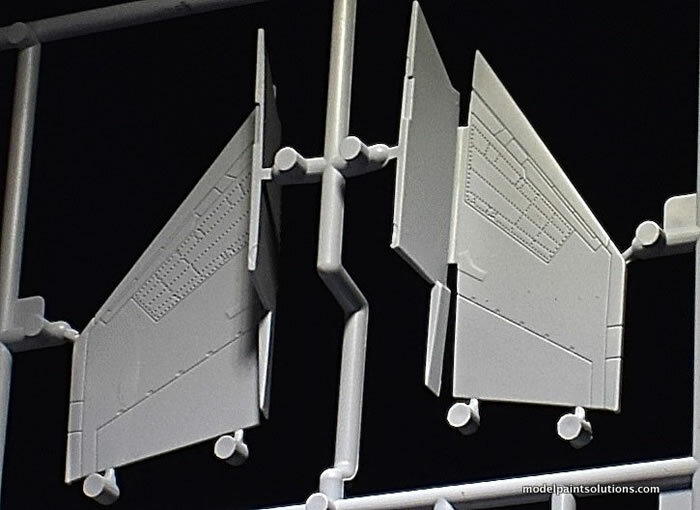 Once the upper halve of each wing is in place the control surfaces on the leading (slats) and trailing (aileron and flap) edges of the wing are glued in place. Here again the builder will have to choose between a set of in-flight or on-the-ground control surfaces that attach with the appropriate angles. This is a very nice piece of engineering especially if, like me, you intend to build your FG.1 sitting on the ground. After various wing spoilers and airframe covers are added the builder is instructed to assemble and attach the very nicely molded landing gear and wheel well doors. The nose gear is provided in the extended (ready for launch) configuration and must be modified slightly in order to model the gear in the retracted (shorter) configuration as when on the ground. 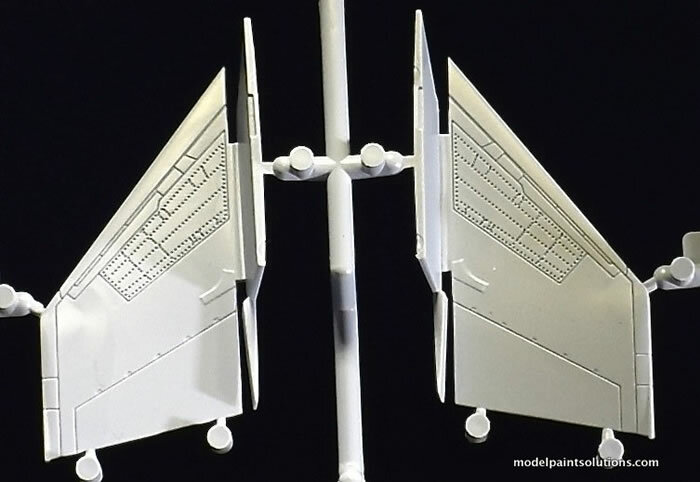 Likewise alternate parts are provided for both the tail hook (up or down) and refueling probe (deployed or retracted). The builder is then presented with a pretty staggering array of options for the hard points should you wish to put a load on your Phantom. These include centerline and wing tanks as well as a nice selection of munitions. An easy to understand chart is provided to assist the builder in placing munitions on the appropriate hard points. 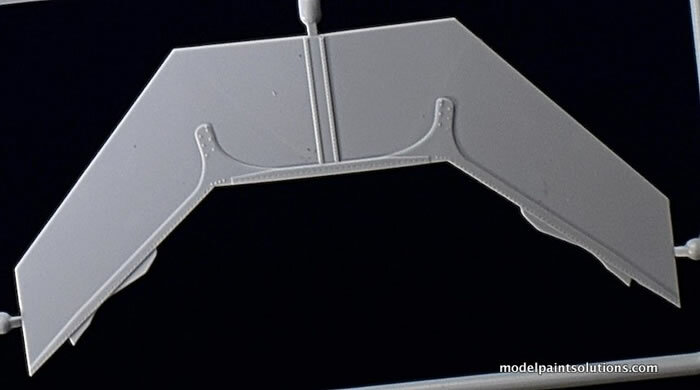 The canopy parts include both, single-piece “closed” or 3-piece “open” options. 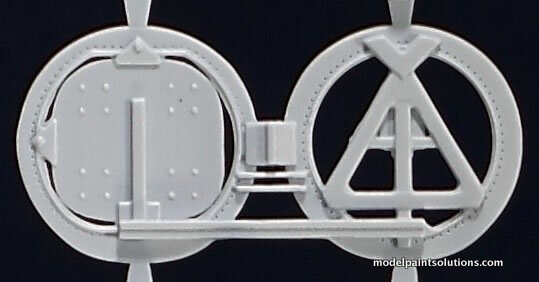 Both options are very clear and nicely molded and should permit good viewing of the nicely detailed cockpit. Last in the building sequence are instructions for building the radome in the “stowed” or folded configuration. 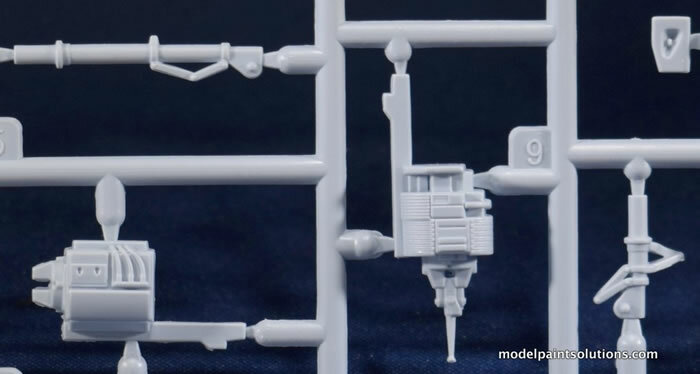 The details here are very nice and include the hinge mechanism, radar unit, and dish. 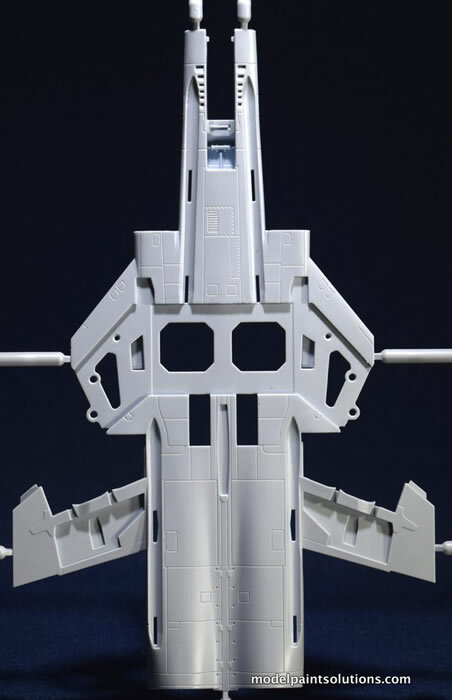 Similarly the internal framing of the nose cone is nicely replicated, as this will be visible when viewed from the front. This looks to be a straightforward build with no surprises. 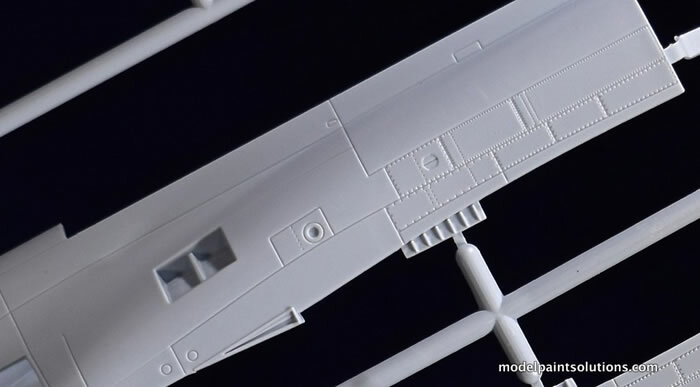 The builder will have to decide to assemble the model in-flight, launching, or stowed and be mindful of parts that are specific for each configuration during construction. Beyond that this should be fun build right out of the box. 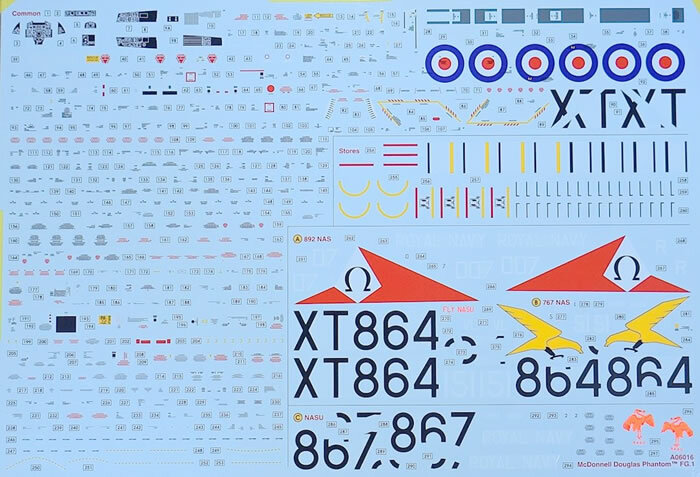 The decal sheet, printed by Airfix, shows good registration and appropriate hue and color. Along with a nice selection of airframe stencils markings for three schemes are provided. McDonnell Douglas Phantom FG.1 No. 892, Naval Air Squadron, HMS Ark Royal, 1974-1975. -Airframe has uppers of Extra Dark Sea Grey and lowers of Satin White. McDonnell Douglas Phantom FG.1 No. 767 Naval Air Squadron, Royal Naval Air Station Yeovilton, Somerset, England, 1971. McDonnell Douglas Phantom FG.1 No. 892, Naval Air Support Unit, Royal Naval Air Station Yeovilton, Somerset, England, 1969. -Airframe has uppers of Extra Dark Sea Grey and lowers of Satin White with a fluorescent bird on the vertical stabilizer. 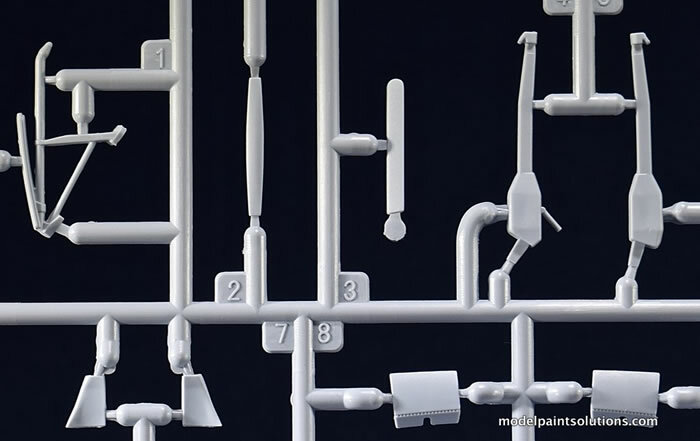 This looks to be another fine kit in a long line of good models from the new Airfix. 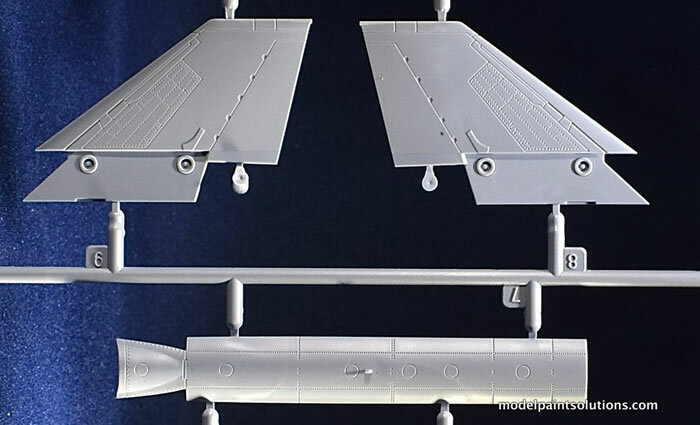 The kit features scale-appropriate panel lines and surface details combined with a surprising low parts count and some novel engineering allowing the builder to easily configure his Phantom in-flight or on the ground in “ready to launch” or “stowed” configurations. 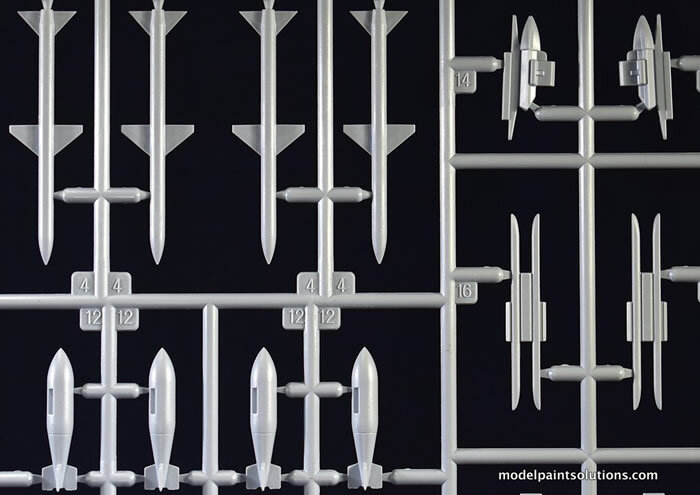 A quality decal sheet complete with airframe stencils rounds out a very nice kit indeed.